Keck Center for Advanced Microscopy and Microanalysis – The Keck Center is located in the Harker Interdisciplinary Science and Engineering (ISE) Laboratory. It houses two 200 kV field emission transmission electron microscopes JEM-2010F and Talos F200C, a LaB6 300kV TEM JEM-3011, an FEI 120kV Tecnai G2 12 Twin TEM, two scanning electron microscopes (JSM-7400F and AURIGATM 60 CrossBeamTM, with the AURIGATM 60 being a FIB-SEM dual beam instrument), and two scanning probe microscopes. 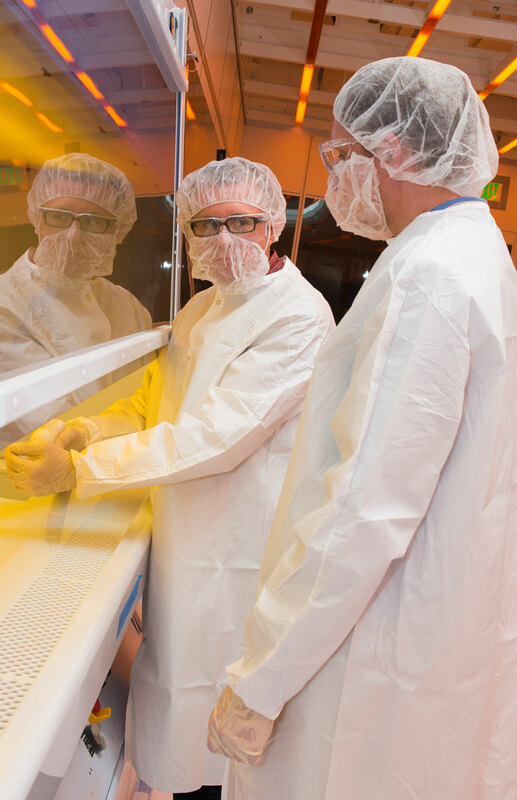 Nanofabrication Facility – This facility provides the infrastructure, equipment and staff support necessary to enable faculty and corporate partners to undertake competitive research and development in the growing number of fields that rely on nanofabrication. The 8,500-square-foot clean room is divided into Class 100 and Class 1000 space. Delaware Biotechnology Institute Core Facilities – Includes bioinformatics, protein production, proteomics, bioimaging, and DNA sequencing and genotyping. Machine Shop – The College of Engineering machine shop consists of a full-service research shop that provides machining, assembly and fabrication services in support of research projects and instructional laboratories for College of Engineering students, staff and faculty working on University projects.